Revisiting the issue of initial attack handline flow rates is critical, given the increase in flashover and rapid fire progression incidents that are injuring and killing firefighters in residential structure fires. Since contents in the typical residential structure in the United States have trended away from organic and cellulose-based materials toward a greater percentage of hydrocarbons, the American fire service must seriously reconsider the manner in which the NFPA 1710 initial attack flow rate is met and applied, as well as consider an increase in the minimum acceptable target flow rate. Today’s fire conditions leave little room for error. The question we must ask is whether or not the first attack line used to make an offensive interior attack to protect firefighters and rescue trapped occupants, often without vertical ventilation or a backup line in place, is supplying a flow rate that is capable of rapidly knocking down a worst-case fire progression scenario and capable of instantly interrupting the fire’s progression to flashover. This flow rate must immediately cool the high-temperature gases and smoke at the ceiling level while absorbing enough heat to effectively cool the surrounding walls, ceilings, floors, and other combustible contents that are about to flash over. Several authors have examined and presented qualitative analyses of the various means by which firefighters mount an aggressive, yet safe, interior attack using 150 gpm. Many fire departments experience the successes associated with an aggressive interior attack using initial attack target flow rates of 150 to 185 gpm. We will use the interrelations of these authors’ experiences and philosophies, engineering and thermodynamic research, and our recent nozzle flow-rate research to provide a quantitative methodology to answer the following question: What is the safest, most effective, and most efficient single-handline flow rate and type for an initial residential structure interior attack? The American fire service prides itself on a rapid, aggressive interior attack. In light of this philosophy, the time-critical nature of applying the correct amount of water on the fire depends on understanding at what point in the development of a fire firefighters typically arrive and enter a burning structure. The efficiency and speed with which today’s firefighters respond to occupied dwellings profoundly affect how precise the initial handline flow rate must be to deal with modern heat-release rates and the potential for flashover. National response time standards suggest that the initial arriving engine company typically making an offensive interior attack with just a single handline will often arrive at approximately the same time as many fires are approaching the flashover stage. The first-time component that we must understand is the time from when a fire is first reported to the time when first-alarm resources initiate their response. According to NFPA 1221, Standard for the Installation, Maintenance and Use of Emergency Services Communications Systems, 2010 edition, an emergency communications center must answer the call for a report of a fire within 15 to 40 seconds from when it is received.5 Correspondingly, the standard also recommends that fire call processing and dispatching be completed within 60 to 80 seconds after the call has been answered. (5) The worst-case scenario presents a situation in which 130 seconds (two minutes and 10 seconds) have passed from the time the reporting party attempted to notify the fire department of the fire to when the initial attack resources were notified. This standard provides several first-alarm time and response standards for career fire departments. With respect to response times, once an alarm is received, the recommended turnout time is one minute and 20 seconds. (5) NFPA 1710 subsequently recommends that from the time the response begins until the first engine arrives at the scene should be four minutes maximum. (3) As a result, the first-arriving engine company that will begin the initial attack should expect to arrive within six minutes of the receipt of the alarm. NFPA 1410 provides that the first two lines will be stretched, charged, and in operation with a water supply established within three minutes of the first engine company’s arrival. (2) An initial arriving engine company will likely make an offensive interior attack without a backup line or water supply in place prior to entering the fire compartment if occupants are trapped. Considering this, two minutes is a reasonable time for the first line to be placed into operation within the structure from time of arrival. A two-minute time allowance would be expected from time of arrival until water is applied into the main fire compartment. This accounts for the first-arriving officer’s providing an arrival report, performing a thorough size-up, and providing proper direction to personnel prior to advancing the line into and through the burning structure to the seat of the fire. As the preceding NFPA standards exist as recommendations that many fire departments strive to meet, they provide a reasonable estimate of the expected time frame within which an initial arriving engine company is likely to arrive at the scene of a reported structure fire. These standards, when considered together, provide that the first nozzle team will enter into the fire area in approximately eight minutes from the time the initial reporting call is made. What all firefighters must consider is that during the response to and suppression of a structure fire, there is truly no way to precisely determine how long the fire has been burning and the phase of development the fire is approaching. In April 2010, the National Institute of Standards and Technology (NIST) released Technical Note 1661, “Report on Residential Fireground Field Experiments.”6 In this research, live-fire studies were conducted using a burn prop built to the NFPA 1710 low-hazard residential structure parameters of 2,000 ft2. One of the primary goals of this research was to study the effects that varying crew sizes have on reflex and operational times at structure fires and provide true operating times for typical fireground operations and tasks at a common residential structure fire. The significance of the 2010 NIST report is that it provides true scale operational times using actual firefighters at a true structure fire and provides data that can be accurately applied to approximate at what time in the fire development curve firefighters most likely arrive on the scene, prepare to make entry, stretch lines to the fire compartment, and initiate fire attack. This report also used response time standards from NFPA 1221 and 1710. In the study, times for firefighters to begin their travel to the fire started at 31⁄2 minutes from when the fire started, and response times were three and five minutes. (6, 31) These times placed the first-due engine arriving at 61⁄2 minutes and 81⁄2 minutes from when the fire started. The next timed parameter was “Advance Attack Line Time,” which was the time from when the first engine arrived and stretched the first line and was in a position to initiate fire attack. (6, 38) The report states that a three-person engine company took 3 minutes and 36 seconds, and a four-person engine company took 3 minutes and 2 seconds to stretch the initial attack line to the fire. The time at which water was first applied to the room-and-contents fire area (“Time to Water”) for the first-due engine company was 9 minutes and 15 seconds for the three-person company and 8 minutes and 41 seconds for the four-person company—a 34-second or 6-percent difference. (6, 39) Correspondingly, this recent research provides accurate evidence relative to the time the modern engine company arrives at the scene of a typical residential structure fire and begins fire attack operations. A transitional phase in the development of a compartment fire in which surfaces exposed to thermal radiation reach ignition temperature more or less simultaneously and fire spreads rapidly throughout the space, resulting in full room involvement or total involvement of the compartment or enclosed area. As mentioned above, the recently released NIST “Report on Residential Fireground Field Experiments” provides data on operational timeline, benchmarks, and reflex times and compares these times against the development of a residential structure fire. Although countless research projects provide that flashover can be expected to occur on average between eight and 10 minutes from ignition, one thing that must be considered is the variability of fire growth rates, which affects the time to which the peak HRR is reached. When a HRR of 1 MW is reached, a minimum radiant heat flux value at floor level of 20 kW/m2 can be expected, which can rapidly lead to flashover and full involvement of the fire compartment, as well as rapid spread beyond the original compartment. (6, 46). However, not all fires burn at the same speed, or rate. The peak HRR and rate of growth of any particular fire is greatly affected by physical and chemical properties of the contents burning, including mass, surface area to volume ratios, and hydrocarbon content. As an example of the potential heat firefighters must deal with following a flashover, when wood paneling was used in the 1985 NIST test to line wall and ceiling surfaces, a post-flashover HRR of 7 MW was measured. (12, 19). This was an enclosed room test with conditions comparable to a compartmentalized structure. Post-flashover heat flux values (radiant heat at floor level) measured 130 to 220 kW/m2, much higher than the aforementioned materials that experienced flashover when exposed to heat fluxes of 20 kW/m2. (12, 12) What firefighters must learn from this research is that in enclosed structure fires, once preflashover ceiling gas temperatures and floor level radiant heating starts, floor and wall coverings and typical furnishings can flash over in less than five minutes from the time of ignition once the radiant heat at the floor level exceeds 20 kW/m2. (12, 13) When firefighters are in the room next to the one that has just flashed over, preparing to make an attack, their position has now become a target of the radiant heat produced, which can instantly be much greater than 20 kW/m2. Firefighters in such a position must be armed with the firepower to deal with such worst-case, ceiling-level peak HRRs and extreme radiant heat at floor level to prevent their location from flashing over next! The 1985 NIST study’s open-room tests (the fire area had no walls to contain heat and products of combustion) showed that the fire produced the minimum floor radiant heat level—20 kW/m2—needed for flashover. However, in the closed-room tests, the measured floor heat flux was 130 to 220 kW/m2 when the fires were not extinguished early. (12, 12) Firefighters making the initial interior attack will be operating in an enclosed environment that will have walls. Therefore, they must expect radiant heat levels equal to or greater than 20 kW/m2 from adjacent fully involved compartments to affect unignited contents in the room in which they are operating or from which they are directing a stream. This should sound an alarm for all firefighters: If a flashover of contents and materials at floor levels is initiated by a radiant heat level of 20 kW/m2 in less than eight minutes, realize that flashover could very well occur in less than eight minutes in enclosed fire compartments with a possible floor heat flux of up to 130 to 220 kW/m2 from upper surface and upper/gas smoke layers. Clearly, it is possible for a flashover to occur in less than five minutes from ignition. With rooms in residential structure fires having potential peak heat outputs of 7 MW or more, when such preflashover conditions exist, there is little room for error, and the initial attack crew must select a stream that has the reach, thermal penetration, and droplet size to reach not only the burning fuel base but also the primary radiant heat sources that lead to flashover—the ceiling gases and smoke, the burning ceiling, and the burning wall materials simultaneously. This stream, at a minimum, must be capable of absorbing the maximum potential HRR at the ceiling. At the same time, it also must have enough heat-absorbing capacity and mass so that a significant portion of the stream will not turn to steam. These unevaporated droplets, if they are big enough, will then fall to the floor in droplet form, suppressing the primary fuel source and preventing unignited combustibles from flashing over. To estimate the adequacy of a flow rate for a single initial attack handline, we must first estimate the HRR of a given fire compartment or area. Once the worst-case peak HRR has been estimated, we can assess the ability of the selected stream to absorb the predicted amount of heat produced. As referenced above, a HRR of 1 to 2 MW is commonly associated with the minimum upper-level gas temperature that can produce enough radiant heat to induce a flashover. Based on the square footage of the USPS/NIST test, the gypsum-lined rooms had a HRR per square foot of 0.023 HRR/ft2, and the plywood-lined rooms a value of 0.07 MW/ft2. The HRR/ft2 value of 0.07 MW/ft2 was recorded for the USPS test when plywood was used to line the ceiling and walls. Although the USPS tests produced a maximum HRR of 7 MW following flashover, the fire loading of an average home at that time was 1.55 times greater than the fire load of that room used in the test. With an increase in fire loading, a rough field estimate of the HRR could be expected to be up to or greater than 10.9 MW for a room of similar dimensions. Such an approximation is likely to be an oversimplification of the physics and thermodynamics behind fuel loading and the associated HRR. However, firefighters in the streets need a straightforward, user-friendly field value to help them roughly determine if their flow rates are in the “ballpark” of the flow rate needed to combat worst-case scenario HRRs that can rapidly lead to a flashover when no backup line is in place. An office-type fire burning at 100 percent efficiency produces a HRR per square meter of 0.25MW/m2.15 Converting this HRR per-area value to square footage yields a value of 0.023 MW/ft2, which is the same value reported in the NIST/USPS test for the gypsum-lined walls. Although most homes use gypsum-lined walls, the walls may have combustible covers such as wainscoting, paints, wallpaper, pictures, paintings, and so on, so a value of 0.07 MW/ft2, three times that of 0.023 MW/ft2, provides a reasonable safety margin in estimating possible HRRs. This value also provides a margin of safety for those homes with high degrees of clutter, storage, and other fire hazards that so often are found in residential structures in which fires occur. As stated previously, a ceiling temperature of 1,112°F is required to produce enough radiant heat at floor level (heat flux) to cause contents, such as flooring and furnishings, to flash over. The square footage and the HRR of the bedroom in the wind-driven fire study provides a HRR/ft2 of 0.073 MW/ft2 with a fuel load of 4.0 lb/ft2, only one pound greater per square foot than the 1985 NIST/USPS test, using modern-day furnishings. This most recent study excluded the fuel load contributions from the oriented strand board (OSB) subfloor and latex-painted gypsum walls and floors. These HRR values were obtained during the control portion of the NIST/DHS 2008 experiments (no wind applied to the structure while it was burning). The post-flashover peak HRR value of 14 MW in this most recent NIST test with gypsum-lined walls produced a HRR/ft2 similar to the post-flashover HRR/ft2 value from the 1985 NIST tests, in which the walls and ceiling were lined with plywood. This comparison suggests that in the 2008 test with noncombustible walls and a similar fuel load, a higher post-flashover peak HRR likely resulted from increased combustibility of the modern furniture in the 2008 tests. Comparing the results from the 1985 NIST/USPS, the 2003-2004 NIST office fire studies with much higher fuel loads, and the 2009 NIST/DHS Firefighting Tactics Under Wind-Driven Conditions suggests that a value of 0.07 MW/ft2 is an accurate figure to use to estimate the possible worst-case HRR at residential structure fires. The value of 0.07 MW/ft2 for residential structures is consistent with real-scale fire test results over the past 20 years and correlates well against HRRs produced in office fires using similarly aged combustibles. However, with higher fuel loadings and more plastic electronic devices per square foot—i.e., a residential bedroom vs. an office workstation—these factors suggest that this value provides a margin of safety when attempting to establish a field value to estimate single-room peak HRR for contemporary furnishings and interior contents in residential structures based on the square footage of a fire compartment. As noted above, flashover can be initiated with a peak HRR as low as 1 to 3 MW and a heat flux of 20 kW/m2 radiating from ceiling gases to floor level. As will be discussed in greater detail below, firefighters in full structural personal protective equipment (PPE) can at best endure 500°F temperatures and a heat flux of 20 kW/m2 for only 30 seconds. (11, 335) For a single stream operating from within a threatened compartment to be rapidly effective against a possible flashover, that stream must be capable of absorbing the heat produced from the worst-case scenario HRR for that particular compartment or an adjacent involved compartment within 30 seconds to provide the best chance for the survival of firefighters operating within or occupants that may be trapped in that space. When preflashover or rapid fire progression conditions are observed, firefighters committed to interior positions who cannot instantly exit the threatened area must be able to reduce flashover-inducing HRRs and heat flux with a single stream in less than 30 seconds. With decreased sensory awareness, firefighters have a reduced ability to accurately and quickly determine environmental conditions and changes. In the most extreme cases of zero visibility, it is often difficult at best to observe flames in the overhead or other visual clues. Since flashover can occur at approximately the same time as the first hoseline is placed in operation in an offensive interior attack, firefighters may not have the thermal reference history to be able to recognize subtle temperature fluctuations and interior environmental transitions that can occur in a matter of seconds and initiate a flashover. This can cause firefighters to overcommit to an interior position so that if a flashover were to occur and their handline flow rate does not have the heat-absorbing capability to prevent or stop the fire’s progression, they are likely in a fatal situation. Even with the most modern PPE, they likely would not have enough time to exit the structure without incurring serious thermal injury. A given fire requires a specific amount of water to successfully absorb the heat produced in a relatively short time so that a developing flashover can be effectively stopped and occupants not wearing structural PPE can be instantly protected. With many modern residential structures having larger master bedrooms, family rooms, and kitchens, firefighters must expect a HRR greater than that associated with an 8- × 8-foot bedroom. The more floor space available, the more combustible materials inhabitants are likely to accumulate. As discussed above, firefighters can calculate field estimates of worst-case HRRs for residential, commercial, and office structure fires based on the square footage of the area compartment involved. An average value of 0.07 MW/ft2 is suggested for estimating the potential HRR from average residential bedroom fuel loads. For example, a fire that has flashed over in a room 10 feet × 10 feet, similar to that of a small bedroom fire, can be estimated to produce a peak HRR at flashover of 7 MW. However, for a larger room, such as a living room that measures 20 feet × 20 feet, a peak HRR of 28 MW can be estimated. Many modern residential structures contain master bedrooms, family rooms, or garages measuring at least 20 feet × 20 feet. When operating in an interior exposure position, firefighters who have advanced to an interior position close to the seat of the fire must be concerned with the peak HRR from adjacent rooms—open doors, hallways, and uncompartmented areas. Once flashed over, they can instantly expose adjacent exposure compartments to flashover-inducing HRRs and radiant heat levels at the floor where firefighters are operating. 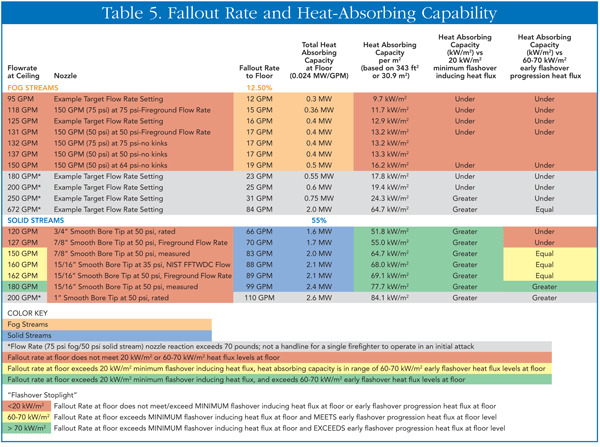 Table 1 lists various room dimensions and the estimated maximum HRRs for later comparison against the heat-absorbing capabilities of various flow rates and stream types. 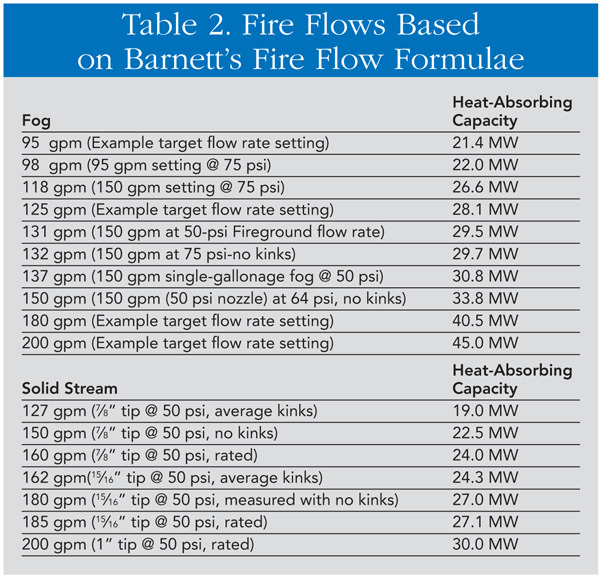 Based on the heat-absorbing capacities of fog and solid streams, Barnett’s Fire Flow Formulae (Table 2) are used to compare the heat-absorbing capacities for fog and solid streams when applied to the ceiling area with a temperature of 1,112°F just prior to a flashover. When selecting a flow rate, firefighters must not only consider the specific stream’s heat-absorbing ability but also understand the ability of the stream to reach, penetrate, and effectively cool ceiling-level smoke and fire gases at 1,112°F. If the walls, ceiling, and floors are not effectively cooled because of an ineffective stream, it is possible that these surfaces may retain enough heat to reignite, causing advancing firefighters to suffer radiant thermal burns and combustible fire gases to ignite when they fall back within their respective flammable range. One gallon of water can absorb only so much heat per second. If the heat-absorbing capability, or knockdown power, of the flow rate is greater than the heat produced by the fire, the HRR, the fire will go out. William E. Clark refers to this required flow rate as the “critical” flow rate.17 Conversely, if the HRR is greater than the heat-absorbing capability of the applied stream when it reaches the ceiling, the fire will not go out in a timely fashion to adequately protect interior operating nozzle teams and trapped occupants. In other words, the critical flow rate has not been delivered! For example, if a fog stream produces a flow of 150 gpm, then the HRR that the stream can absorb is 35 MW at 1,112°F. If a fire in a room is calculated to produce 20 MW, this flow rate will be effective in absorbing the heat produced. However, if the same stream cannot reach or penetrate the 1,112°F ceiling gases and smoke, or if the HRR is 40 MW, then the stream would not be able to effectively control the fire in the time desired for firefighter or occupant protection. Considering this, when you commit to an interior attack, you select an initial attack flow rate at the exterior of the structure. This gpm selection is based on exterior conditions from a distance, not on conditions inside the structure. If a handline with a flow rate of less than 150 gpm is taken into the structure, the stream’s effective heat-absorbing capacity and flashover-inhibiting power may not be sufficient to rapidly combat the HRR if the entire contents of a room become involved. The increasing use of lightweight building materials for initial construction as well as remodeling, repair, and renovation projects; improved insulating materials; and energy-efficient windows indicate that as use of these materials becomes more common, a greater percentage of fires will retain a greater amount of heat and combustible smoke in the fire compartment as compared with the past. As exemplified in tests conducted by Underwriters Laboratories, using ASTM Method E119, it has been demonstrated that modern lightweight building materials for residential and commercial structures, such as wooden I-beams and OSB for flooring materials, can fail in as little as six minutes on exposure to fire.18 Increased use of lightweight building materials underscores the need to select fire streams that can do the following: (1) penetrate fire gases at the ceiling level and (2) immediately and effectively absorb the total heat output that is actively attacking exposed flooring and materials at the ceiling. Not all flow rates and stream types have the reach, momentum, or mass to penetrate fire and smoke gases rapidly approaching or at 1,112°F, and not all flow rates possess the heat-absorbing capacity, using a single stream, to effectively suppress a fire in an offensive interior attack in a relatively short time. In the early 1980s, instructors at the National Fire Academy (NFA) “examined the practicality of the Iowa formula for normal operations,” including use for an offensive interior attack initiated by a single engine company, concurrent search operations, vertical and horizontal ventilation, and sequential support operations. (19, 3) The instructors then surveyed a number of NFA students in simulated fire scenes, where the fire building was assumed to be 50 percent involved, the fire attack initiated with a single interior attack line, and “primary search and ventilation operations would be achieved simultaneously with fire flow operations.” (19, 3) The students provided their own assessment of needed flows per line to operate such an interior attack. Based on their estimates, the instructors determined the corresponding average flow rate based on square footage vs. the estimated flow rate. The corresponding formula is (Area)/3. Using the square footage NFPA 1710 provides for a two-story residential structure no more than 50 percent involved in fire, the NFA flow formula calls for a rate of 666 gpm. This could include total involvement of the entire second floor, totaling 1,000 ft2 for multiple compartments. It is highly unlikely that any single compartment on the second floor of a typical residential structure would be 1,000 ft2. As discussed above, a room measuring 23 feet × 23 feet, similar to that of a two-car garage or a large family/bonus room, covers a square footage of just over 500 ft2. The corresponding single-line flow rate for such an area using this formula would be 167 gpm. Using the HRR/ft2 value of 0.07 MW/ft2 discussed above, if a two-story residential structure of 2,000 ft2 were 50 percent involved (1,000 ft2), a total HRR of all simultaneously involved compartments would be estimated to be 70 MW. Based on the heat-absorbing capabilities of a single fog or smooth bore handline listed above at manageable nozzle reactions for a single person, more than one handline would be needed for this extent of involvement. 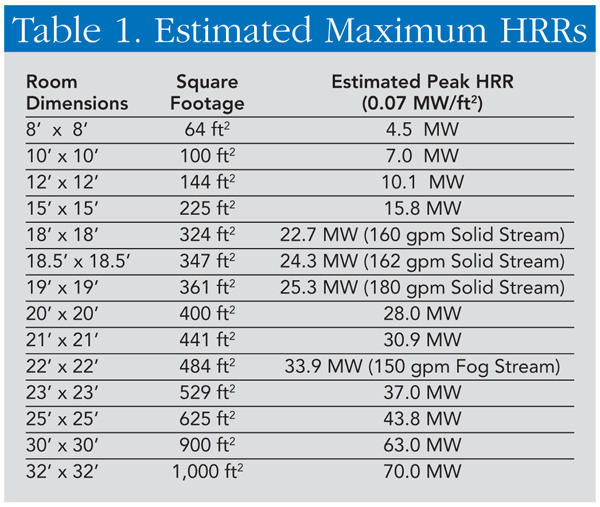 However, for a room of 500 ft2, an estimated peak HRR would be 35 MW, which would be much more likely to be controlled by the heat-absorbing capabilities from a stream with a flow rate in the range of 150 to 185 gpm. NFPA 1710, Section 5.2.4.2.2 requires the “establishment of an effective water-flow application rate of 1,110 L/min (300 gpm) from two handlines, each of which shall have a minimum of 370 L/min (100 gpm).” (3, 9) In a personal communication with Chief (Ret.) Alan Brunacini, NFPA 1710 chair, the intent of selecting 300 gpm as the first-alarm interior attack flow rate was based on the ability to confine and extinguish an average single room-and-contents fire in a two-story residential structure fire of 2,000 square feet. This flow rate does not account for more than the involvement of one room.20 Furthermore, this standard is based on a residential structure of low-hazard and with no basement and no exposures. (6,16) Firefighters must make the necessary adjustments and base their flow rates on the fires they are more likely to face and/or be injured on and face a higher rate of fire growth or flashover risk: high-hazard residential structures of multiple room involvement on arrival. To meet the 300-gpm standard identified in NFPA 1710, the use of a 100-gpm handline is consistent with the NFPA 1710 standard of using handlines with a minimum flow rate of 100 gpm; however, the second handline must flow 200 gpm. Assuming that a given fog nozzle could provide a flow rate of 200 gpm at the following nozzle pressures, the nozzle reactions for 50-, 75-, and 100-psi fog nozzles would be 71, 87, and 101 pounds, respectively. For 1½-inch hose, the friction loss at 200 gpm, using a traditional “C” value of 24, would be 96 psi per 100 feet.21 A friction loss value of 62 pounds per 100 feet is calculated for a 1¾-inch handline using a “C” value of 15.5. (21) The pressures needed to flow 200 gpm through 1½-inch hose clearly indicate that 1¾-inch hose is a much safer and more efficient conduit for flow rates exceeding 125 gpm. Furthermore, 1½-inch hose at 200 gpm using fog nozzles would be limited to lengths of 300 feet to avoid dangerous discharge pressures, increased potential for burst lengths of hose, and very stiff hoselines that would be difficult to bend around the numerous corners and narrow hallways found in single-family and multiple-family dwellings. NFPA 1710 recommends that the first two attack lines operating at a residential structure fire, once all first-alarm resources are on scene, should flow a minimum of 300 gpm. Several of the NFPA 1410 standard residential structure fire attack evolutions provide that the first two operating handlines at a residential structure be two 150-gpm handlines is logical, given response and reflex times, potential for flashover, nozzle reaction, and simultaneous fire attack and primary search demands placed on the first-arriving engine company. When applied to the residential structure referenced in NFPA 1710, a minimum single handline flow rate of 150 gpm coincides with the NFA Fire Flow Formula, the NFPA 1710 300-gpm first-alarm flow rate, and the heat produced at a residential structure fire of low risk using a field estimate of a HRR/ft2 value of 0.07 MW/ft2. Over the past several years, there has been a great deal of discussion on verifying the actual flows from various nozzles used for interior residential fire attack operations. Many of these discussions have highlighted the need for firefighters to test their nozzles to determine what their actual flows are. In August and September 2008, members of Sacramento (CA) Metropolitan Fire Department’s Command Training Center Hands-On Training Team flow-tested all of the department’s handlines and nozzles, as well as a 15⁄16-inch smooth bore nozzle and a 50-psi, 150-gpm single-gallonage fog nozzle. The tests were to provide Metro Fire members with accurate flow data for all interior attack lines using department standard fog and smooth bore nozzles. All nozzles were operated and flow-tested at the manufacturers’ designed pressure of 50 psi (smooth bore) or 75 psi (fog). As reported in previous studies, actual flows from fog nozzles were found to be less than the stated flow. Conversely, from all smooth bore nozzles, flows either met or exceeded the flow rate for the specific tip diameter at 50 psi. Although 1½.-, 1¾-, and 2½-inch handlines were tested, only the results of the tests for the 1¾-inch handlines are discussed in this article. Another component of the Metro Fire tests included imposing the same kinks as was done in the Rockland County research. Wooden templates were constructed to ensure that the exact same angles were imposed on each repetitive test. In the Metro Fire tests, hose lengths of 200 feet were used, since most attack lines subjected to this extent of kinking in this department’s experience exceed 150 feet. (Metro Fire uses a single 150-foot preconnected attack line; all other handline beds are dead/static loads of 400 feet or greater.) The first 50 feet and the last 50 feet of hose were kept kink free; kinks were imposed on the middle two hose sections. The results of the Metro Fire flow tests closely paralleled those of the Rockland County tests. Table 3 provides the average flows with kinks imposed (excluding the double 180° kinks) from the Metro Fire tests. Note that all standard Metro Fire fog nozzles use an integral smooth bore tip should an engine company officer elect to use a smooth bore nozzle for fire attack operations. The standard Metro Fire fog nozzle used on 1¾-inch handlines is an adjustable-gallonage fog nozzle rated to flow 30 to 200 gpm at 75 psi, tested at the 150-gpm setting with an integral 7⁄8-inch tip rated to flow 160 gpm at 50 psi. The other nozzles tested were a 15⁄16-inch smooth bore nozzle and a single-gallonage fog nozzle rated to flow 150 gpm at 50 psi, with an integral 15⁄16-inch tip rated to flow 185 gpm at 50 psi. One of the more significant findings was the ability of the solid streams, at similar initial flows and at lower nozzle pressures (50 psi), to maintain a higher average flow when kinks were imposed. Very similar results were produced in the Rockland tests. One interesting finding for fog nozzles is that as the design nozzle pressure increased from 50 to 75 to 100 psi for the 150-gpm fog nozzles, the average flow with kinks decreased from 135 gpm (50 psi fog) for Metro and 133 gpm for Rockland (50 psi fog) to 118 gpm for Metro (75 psi fog) and 111 gpm-Rockland (100 psi fog), respectively. This indicates that as the required nozzle pressure increases, the ability to maintain a flow near 150 gpm decreases when kinks are imposed on the hoseline—in other words, as the required operating pressure for a fog nozzle increases, it is more susceptible to flow reduction by kinks. The flow that a nozzle team fights fire with must account for typical initial attack line problems such as kinks, car tires, unsecured doors, narrow hallways, and so on. This is even more true of engine companies operating with only three personnel, where two personnel are stretching and operating the handline with no additional assistance in the first few critical minutes of an initial attack. For purposes of identifying target flow, the authors call this average flow that takes into account reductions from standard kinks the “fireground flow.” Such kinks and flow-restricting conditions may not be identified and removed until other crews arrive well after the first line is operating within a structure (for instance a confirmed rescue/trapped occupant). From Table 3, we see that the minimum initial target flow capable of providing an average minimum “fireground flow” of 150 gpm is 185 gpm. However, when the authors experimented with a measured nozzle inlet pressure of 75 psi with the 50 psi, 150-gpm fog nozzle, they measured a flow rate of 185 gpm. The calculated nozzle reaction was 81 pounds. Given that the goal of initial attack handlines is to select a nozzle reaction of less than 70 pounds so that the nozzle can be managed effectively and safely by one person, this nozzle pressure and flow will be excluded. Table 4 presents flow rates and calculated nozzle reactions the authors determined during recent flow tests. During initial attack operations, most engine companies in the United States are likely to select 1¾-inch handlines as the first two lines. (1)Since NFPA 1710 recommends a total flow of 300 gpm from the first two handlines, a handline with an initial minimum flow rate of 180 gpm, without kinks or flow restrictions, will be needed to ensure, with a good degree of certainty, that each nozzle is delivering on average 150 gpm over the course of the fire attack. Considering that an initial minimum flow rate of 180 gpm is needed if two like lines are to be used to ensure a total fireground flow rate of at least 300 gpm, the nozzle reaction associated with this flow rate must be assessed to determine the safest and most efficient way for a two-person nozzle team to meet this standard for safety and effective fire attack operations. In Table 4, the minimum nozzle reaction associated with a given nozzle capable of producing a flow (with kinks averaged in) from two similar lines meeting the 300-gpm NFPA 1710 recommendation is 69 pounds. In these tests, fireground flow rates produced by nozzles with nozzle reactions less than 69 pounds did not meet the NFPA 1710 recommendation. Conversely, although larger lines with flow rates approaching 300 gpm could be used, such as a 2½-inch handline, the associated nozzle reaction would exceed the recognized safe single-firefighter maximum nozzle reaction of 69 pounds. (13, 132). A nozzle’s flow rate efficiency can be determined by comparing the nozzle’s flow rate against nozzle reaction. Table 4 reveals that when comparing flow rate against nozzle reaction, the minimum initial flow rate capable of meeting the NFPA 1710 recommendation from two like lines must have an efficiency greater than or equal to 2.61 gpm per pound of nozzle reaction. Of the nozzles evaluated, only two nozzles had reactions less than 69 pounds (single firefighter maximum) with fireground flow rates that meet the NFPA 1710 recommendation: the two 15⁄16-inch smooth-bore nozzles with nozzle inlet pressures of 50 psi. All other streams evaluated in this test either had a nozzle reaction in excess of 69 pounds or a fireground flow rate, inclusive of kinks, of less than 150 gpm per line. This indicates that two like lines would not reliably meet or exceed the 300-gpm recommendation when typical hoseline management problems are encountered during early initial attack operations. The authors would like to thank the following for their assistance: Sacramento (CA) Metro Fire Department: Assistant Chief Brian Rice, Battalion Chiefs Andoni Kastros and Ed Crawford; Captains Chris Greene, Randy Gross, and Darren Taylor; Engineers Mike Welch, Dale Darnell, Ronni Sorgi, and Bryan Barthel; and Firefighters Bob Santee, Mark Schreck, and Rich Turner. Special thanks also to Oakland (CA) Fire Department Lieutenants Jay Comella and Darryl Liggins and Denver (CO) Fire Department District Chief David McGrail. The authors also acknowledge the great contributions of the late Andrew Fredericks. Coleman, John, “Nozzle Settings,” Fire Engineering, June 2006. NFPA 1410, Standard on Training for Initial Emergency Scene Operations, 2010 edition. [Quincy, Mass. : National Fire Protection Association (NFPA)]. NFPA 1710, Standard for the Organization and Deployment of Fire Suppression Operations, Emergency Medical Operations, and Special Operations to the Public by Career Fire Departments, 2010 edition, NFPA. Comella, Jay, “Planning a Hose and Nozzle System for Effective Operations,” Fire Engineering, April 2003. NFPA 1221, Standard for the Installation, Maintenance, and Use of Emergency Services Communications Systems, 2010 edition, NFPA. “Report on Residential Fireground Field Experiments” National Institute of Standards and Technology (NIST) Technical Note 1661, Gaithersburg, MD: U.S. Dept of Commerce, April 2010, 31. “Estimating Temperatures in Compartment Fires”. In SFPE Handbook of Fire Protection Engineering, 3rd Edition, DiNenno P, D Drysdale, CL Beyler, WD Walton, eds. 2002: 3, 171-188. Kennedy, Kathryn C. and Patrick M Kennedy, “Flashover and Fire Analysis: A Discussion of the Practical Use of Flashover Analysis in Fire Investigations,” Investigations Institute (Sarasota, FL: John A Kennedy and Associates, Inc, 2003). Spearpoint, M, FW Mowrer, and K McGrattan, “Simulation of a Compartment Flashover Fire Using Hand Calculations, Zone Models, and a Field Model,” International Conference on Fire Research and Engineering, Third Proceedings. Oct 4-8, 1999, Chicago, IL. (Boston, Mass: Society of Fire Protection Engineers; 1999, 3-14). Babrouskas, Vytenis, RD Peacock, and PA Reneke, “Defining Flashover for Fire Hazard Calculations: Part II,” Fire Safety Journal, Elsevier Science Ltd.; 2003 (38). “Fire Fighting Tactics Under Wind-Driven Conditions: Laboratory Experiments,” NIST Technical Note, Gaithersburg, MD: U.S. Dept of Commerce, 2009. “Effect of Wall and Room Surfaces on the Rates of Heat, Smoke, and Carbon Monoxide Production in a Park Lodging Bedroom Fire,” National Bureau of Standards NBSIR-85-2998, Gaithersburg, MD., U.S. Dept. of Commerce, 1985, 13. Fredericks, Andrew A, “Little Drops of Water: 50 Years Later, Part II,” Fire Engineering, March 2000, 1 2. Dunn, Vincent. Strategy of Firefighting. [Tulsa, OK: Pennwell Corporation, 2007, 40]. Grimwood, Paul and C Barnett, “Fire-Fighting Flow Rate,” www.firetactics.com, Jan 2005, 38. “Cook County Administration Building Fire, Heat Release Rate Experiments and FDS Simulations.” NIST Special Publication SP-1021, Gaithersburg, MD: U.S. Dept of Commerce, 2004, 75. Clark, William E. Firefighting Principles and Practices, 2nd Edition. (Saddle Brook, NJ: Fire Engineering Books and Videos, 1991, 34). “Structural Stability of Engineered Lumber in Fire Conditions,” Online Course.” Underwriters Laboratories. U.S. Department of Homeland Security; 2008. Available Online: http://www.ul.com/global/eng/pages/offerings/industries/buildingmaterials/fire/structural/. Burns, Edward and BW Phelps, “Redefining Needed Fire Flow for Structure Firefighting,” Fire Engineering, Nov 1994, 22. Brunacini, Alan, telephone conversation, Jan 9, 2009. ”Pumping Apparatus Operations,” IFSTA, 186..
Flatley, Christopher, J Knapp, and T Pillsworth, “Testing Your Target Flow,” Fire Engineering, Oct 2006. Leihbacher, Doug, C Flatley, J Knapp, and T Pillsworth, “How Kinks Affect Your Fire Attack System,” Fire Engineering, Oct 2007. JASON N. VESTAL has 14 years of experience as a career firefighter. He is a captain with the Sacramento Metropolitan (CA) Fire Department, where he has worked since 2000. He has an A.S. in fire science from Allan Hancock and a B.S. degree in environmental and resource sciences with an emphasis in hydrobiology from the University of California at Davis. ERIC A. BRIDGE has been a career firefighter for 17 years and is a battalion chief with the Sacramento Metropolitan (CA) Fire Department, where he has worked since 1994. He has an A.S. in fire science and a B.S. in occupational studies from California State University-Long Beach. Even the smallest flow rate nozzle, regardless of stream type, if operated long enough, can suppress any fire in a confined compartment. However, when the lives of trapped occupants or firefighters are at stake, an aggressive stream that can effect a rapid knockdown is needed to place an effective volume of water between the occupants and the advancing fire without steaming those people within the compartment or areas opposite the applied stream. As discussed above, the modern-day engine company should expect that its arrival time is in line with a flashover event. As provided by the National Institute of Standards and Technology (NIST) in the April 2010 report on Residential Fireground Field Experiments, a timed three-person engine company and a four-person engine company began applying water to the room-and-contents fires with an “early arrival,” at 11 minutes and 24 seconds and 11 minutes and 11 seconds, respectively, with the fires producing a high release rate (HRR) of 1-2 megawatt (MW), which is within the HRR ranges necessary to induce a flashover.1 These two factors alone necessitate that a single stream be capable of effectively and safely absorbing the heat release rate of the fire at hand while also capable of immediately reducing the chance of a flashover or stopping a flashover that may be well into development. The “3D Fire Tactics” method, as presented by Grimwood provides an interior nozzle team with a method to buy additional time to retreat to a safety zone when impending flashover conditions are observed.2 This technique suggests using high-pressure fog nozzles that produce droplets in the 0.2- to 0.4-millimeter (mm) range. This technique necessitates using “pulses” of fog spray less than one second in duration. This method and stream type are not intended to stop an impending flashover or to confine, control, or extinguish an interior fire. (2) Using this method to advance into a room necessitates that firefighters advance very close to the seat of the fire (as opposed to the safety provided by the reach of a straight or solid stream nozzle), which then necessitates that the nozzle operator adjust the fog back to a straight stream and use a direct attack to suppress the fire. Grimwood points out that the 3-D fog tactic buys firefighters time to retreat in the context of an impending flashover. However, when a flashover is about to occur, because the nozzle flow rate cannot suppress the fire, the 3-D Fog Tactic may not instantly reach or cool ceiling gases at the flashover temperature of 1,112°F. Additionally, the fog stream would not rapidly affect ceiling gases and smoke at 1,112°F above the five-foot height and may not immediately affect an impending flashover or be able to stop radiant heat from ceiling gases that can ignite floor level combustibles. This is a concern, since the ceiling heights in most residential structures are eight to 10 feet. Based on this statement, the 3-D method is a means for advancing into a fire area, not an in-place survival technique when a flashover is about to occur or is occurring. When situational awareness of fire conditions is limited or entirely masked, flaming in the overhead is often not easily apparent and the signs that signal an imminent flashover can be easily missed; firefighters in such a position will likely not have enough time to evacuate. The 2009 NIST wind-driven report discusses firefighter survivability in flashover conditions in the context of heat flux, which is the intensity of radiant heat at floor level. Previous NIST research suggests that a firefighter in full structural personal protective equipment (PPE), when exposed to temperatures in excess of 500°F combined with a heat flux in excess of 20 kW/m2, will survive less than 30 seconds.4 As ceiling gases produce a HRR of 1 MW just prior to flashover, the heat flux at the floor level will be at least 20 kW/m2. In this study, measurements in the fire compartments immediately following flashover showed “post-flashover heat flux conditions ranging from 60 to 160 kW/m2.” (4) NIST researchers observed that all the fires analyzed produced conditions in the corridor (center hallway) downwind from the room of origin in excess of 500°F and 20 kW/m2. (4) Even in areas remote from the fire compartment, radiant heat at floor levels greater than 20 kW/m2 can be expected and rapidly provide the necessary radiant heat energy to cause a flashover in the adjacent room or compartment where advancing firefighters are likely positioned. It is logical that injuries will increase when using fog patterns in an interior attack, as the low-pressure region created at the fog nozzle tip is often held near the head of the nozzle operator.7 As reported in 2004 by Knapp, Pillsworth, and Flatley, a fog stream flowing 150 to 180 gpm can also inject a volume of air well in excess of 2,000 cubic feet per minute (cfm) of air to the fire compartment and also creates air currents that can carry superheated air, steam, and smoke back to the nozzle.8 In comparison, the 180-gpm stream from a 15⁄16-inch smooth bore tip was measured to move only 500 to 710 cfm.9 These findings were the results of nozzle air flow tests that dramatically illustrated the effect that nozzle choices can have on air movement and firefighter and occupant safety during interior attack operations. Not only should engine company members advancing a hoseline consider these results in making their flow rate selection, but firefighters conducting search operations opposite the nozzle and fire (such as vent-enter-search operations) or approaching the fire room in a hallway (such as approaching truck company members in a center hallway) should truly appreciate the significance of an engine company’s members applying the correct flow rate in the correct form for their own safety. Fornell provides in his works that a solid stream is better able to penetrate high heat and thermal drafts, as the uninterrupted path of a solid stream keeps the water held in a tight mass. (8, 95) In comparison, Fornell notes that even a straight stream produced by a fog nozzle requires the water to be redirected several times in its path before exiting and thereby entrains a large amount of air between water droplets. Fornell states that at 30 feet, the solid stream covers two square feet and the fog stream covers approximately 100 square feet. Contrasting the reach and penetration of a 185-gpm solid stream from a 15⁄16-inch smooth bore tip and that of a 185-gpm fog stream in a 30° narrow fog pattern, Fornell continues that at 30 feet from the nozzles, the solid stream delivers 92.5 gpm per square foot while the 30° fog stream at the same initial gpm provides only 1.9 gpm per square foot, assuming that the small droplets from the fog stream are able to penetrate the fire plume and thermal updrafts and reach the ceiling. (8, 95) Using these coverage values, it would take a 30° fog pattern at 1.9 gpm 48 minutes to provide the same coverage to surfaces and the seat of the fire as the 15⁄16-inch stream can in only one minute. As discussed, the critical factor in stopping a flashover sequence is to simultaneously cool ceiling-level gases; elevated ceiling, wall, and floor surfaces; and also the seat of the fire producing the heat. Therefore, as the rate at which a volume of water can be directly delivered to such areas increases, so will the rate at which gas temperatures, surfaces, and heat sources are reduced. In near flashover conditions with a ceiling temperature of 1,112°F, a heat-absorbing capacity of 0.3 MW/gpm, and their respective efficiencies, the solid stream can absorb 13.9 MW/ft2, whereas the fog stream has a much lower heat-absorbing capacity of 0.43 MW/ft2. The differences in ceiling gas and surface cooling power, flashover potential reduction, and knockdown potential are clear. Grimwood reports on research that assessed the ability of streams with different sizes of droplets to cool wall surfaces during the first two minutes of application: For a droplet 0.33 mm in diameter, the approximate diameter of a fog-stream droplet, reduced the wall temperature by 135°F; however, when droplets with a diameter of 0.78 mm were evaluated, the wall temperature was reduced by 383°F.13 In other words, as the size of the droplets reaching heated surfaces such as ceilings and walls increases, the magnitude of the temperature reduction also increases. Therefore, to cool surfaces in a fire faster, the larger the droplets at the ceiling, the greater the temperature reduction throughout the entire compartment.At a droplet diameter of 0.8 mm (approaching the diameter of a solid stream droplet), 48 percent of the stream falls to the floor, 48 percent evaporates, and about 4 percent is lost in convection current, where it continues to recirculate in air currents produced by the fire. This 4 percent fraction of the stream does not evaporate, and it does not fall to the floor. It is essentially wasted, recirculating as hot steam in the center of the room. At a droplet diameter of 1.0 mm, approximately 42 percent is evaporated at the ceiling level, 55 percent falls to the floor, and 3 percent is wasted in the convection column. As droplet diameter increases, the amount of water that can fall back to the floor and burning materials increases. Whatever isn’t used to cool high-temperature fuel gases and hot surfaces at the ceiling level will fall to the ground, directly suppress the seat of the fire, and also prevent unignited fuels from reaching their flashover temperature. Larger droplets place more water where it is needed—the ceiling, walls, and floor—and trap less water in the convection column between the ceiling and the floor. The fire sprinkler industry has studied water droplet behavior in fires extensively. Sprinklers must produce droplets that possess a mass and volume heavy enough to produce a terminal velocity that can fall from the ceiling down through the thermal column and land on the floor and smother burning fuels. Although the smaller and lighter droplets produced by fog streams have a higher surface area to volume ratio and are highly effective at reducing temperatures in the convection column, these droplets get trapped between the floor and the ceiling. In this location, these droplets do not cool burning ground fuels, burning walls, or ceiling surfaces and do not have an immediate effect on the 1,112°F flashover fuel gases in upper levels. Be aware that as more droplets and steam get trapped in the convection column in the center of the room, the more likely you are to experience steam burns to your upper body, neck, and ears. Water that falls to the floor of a fire compartment and covers unignited combustible materials, such as carpeting and furniture, can absorb 0.38 MJ/kg, or 0.024 MW/gpm, of radiant heat from the ceiling. (11, 53) HRRs produced by ceiling gases at a temperature of 1,112°F have been reported to be between 1.2 and 2.0 MW just prior to flashover. When selecting a single-line initial attack flow rate, choose a flow rate that can simultaneously cool the overhead and prevent floor-level combustibles from flashing over. A floor droplet rate of 84 gpm is needed to effectively absorb an overall HRR of 2 MW. Considering that solid streams produce droplets equal to or greater than 1.0 mm in diameter, with at least 55 percent of the stream flow falling back to the floor, we recommend a single-line minimum fireground flow rate of 152 gpm from a solid stream to penetrate the ceiling gases to ensure that 84 gpm will reach the floor in droplet form. Using a fog nozzle, which may have approximately 12.5 percent of its droplets fall back to the floor, you would have to apply a flow rate of 672 gpm to the ceiling to obtain a droplet fallout rate (DFR) of 84 gpm. In the 2008 NIST study, the 15⁄16-inch smooth-bore nozzle produced a flow rate of 160 gpm. (4, 294) In tests conducted by the authors, the 15⁄16-inch smooth-bore nozzle produced a fireground flow rate (FFR) of 162 gpm. Using the 160-gpm flow rate, a field approximation of the maximum—in other words, worst-case—peak HRR that a 160-gpm solid stream can effectively absorb at a ceiling temperature of 1,112°F is 343 ft2 (30.9 m2) or a room 18.5 feet × 18.5 feet, which is estimated to produce a peak HRR of 24 MW. When 160 gpm is applied at the ceiling, a DFR of 55 percent and approximately 88 gpm is predicted to fall to the floor onto burning materials and unburned fuels. Once on the floor, this water that is collecting on unburned fuels can absorb 0.38 MJ/kg, or 0.024 MW/gpm, of radiant heat. At 0.024 MW/gpm, a DFR of 88 gpm can absorb 2.1 MW at floor level. Dividing 2.1 MW by the maximum square footage associated with the peak HRR that the 15⁄16-inch solid stream can handle (fireground flow rate of 162 gpm) predicts that 89 gpm at floor level can effectively absorb a heat flux value of 69.1 kW/m2. This potential heat flux capability value for a 160-gpm solid stream is similar to, and slightly exceeds, the preflashover heat-flux values reported by the 2009 NIST study. 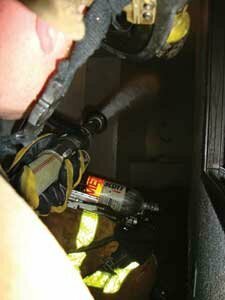 By rapidly sweeping the stream across the ceiling when preflashover conditions are observed, a nozzle team should be able to distribute droplets throughout an 18-foot × 18-foot room successfully. If a solid stream with a heat flux capability of exactly 20 kW/m2 for an 18-foot × 18-foot room is desired, an initial fireground flow rate of 46 gpm would be needed, and a DFR of 25 gpm would be predicted to fall from the ceiling. Although this droplet rate could, in theory, absorb the minimum floor heat flux value of 20 kW/m2 that can initiate a flashover, the flow rate of 46 gpm from a smooth-bore nozzle at the ceiling could address only a HRR of 6.9 MW at the ceiling level. Solving for area, at a HRR/ft2 of 0.07 MW/ft2, the maximum square footage this 46 gpm stream could handle would be 100 ft2, or approximately a room 10 feet × 10 feet. 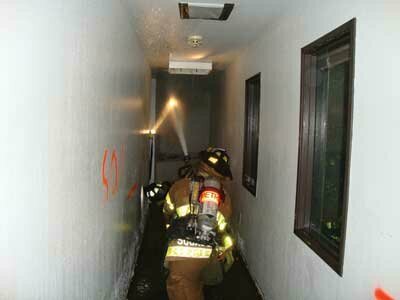 A flow rate of 25 gpm at the floor does not leave much room for error, and the flow rate at the ceiling does not provide enough flexibility to address many rooms in a residential structure that are often larger than 10 feet × 10 feet and that are encountered in a progressive multiroom interior attack. Although it is not possible to flow 672 gpm from a fog nozzle in an interior attack with a single nozzle team, you can easily flow 152 gpm from a single smooth-bore handline. As noted above, the 15⁄16-inch smooth-bore nozzle delivers 180 gpm without kinks and an FFR of 162 gpm when flows with kinks are averaged. With kinks averaged, the flow of 162 gpm from the 15⁄16-inch smooth-bore nozzle has the reach, penetration, and heat-absorbing capability to absorb the heat produced in a typical residential room near flashover up to 347 ft2, or a room that is 18½ feet × 18½ feet and, with no kinks, a room that measures 19 feet × 19 feet. These values indicate that the 15⁄16-inch solid stream, with or without kinks, can rapidly knock down a fire in a room of dimensions in the range of up to 18 to 19 feet on each side. The average flow rate of 162 gpm with kinks produces a DFR of 89 gpm with a heat-absorbing capability at floor level of 2.14 MW. When no kinks are imposed on the 15⁄16-inch handline, a floor droplet rate of 101 gpm with a predicted maximum heat-absorbing capability on floor surfaces of 2.38 MW is possible. This suggests that the solid stream produced by the 15⁄16-inch smooth-bore nozzle also can absorb a considerable amount of radiant heat at floor level where unignited combustibles are located, thereby providing a secondary protective factor to minimize the chances of a flashover. The effectiveness of the 15⁄16-inch stream and its associated characteristics were demonstrated in the NIST wind-driven study. The 15⁄16-inch smooth-bore nozzle produced a flow of 160 gpm at 35 psi and exhibited dramatic and instant results in reducing heat release rates, ceiling temperatures, and radiant heat at floor level in approximately 30 seconds in several of the fire apartment rooms, hallways, and the center corridor outside of the apartment. This suggests that the heat-absorbing capabilities of a 160-gpm solid stream can handle the post-flashover conditions associated with a fully involved room at a HRR of 0.07 MW/ft2 in an effective amount of time, even when nozzle pressure is less than 50 psi because of various fireground situations that can reduce nozzle pressure commonly encountered on the fireground. The rapid knockdown observed with a solid stream at a flow rate of 160 gpm suppressed a fire at the HRR measured demonstrated under closely monitored conditions that this flow rate and stream type rapidly improve conditions for firefighters who may be approaching or operating in such a hostile and rapidly changing environment. We have presented a quantitative methodology for selecting an initial attack flow rate and stream type for use in an interior attack using a single handline. The initial line must be of a flow rate and type that can penetrate the elevated temperatures and smoke at the ceiling level, instantly and effectively absorbing the anticipated heat release rates from interior compartment fires approaching flashover. In addition, today’s understaffed engine companies must be able to safely and efficiently handle the nozzle with one nozzle operator. The flow rate must enable the interior attack nozzle team to protect itself and trapped occupants by rapidly cooling all levels in a compartment, should the signs of an impending flashover develop. Last, the initial flow rate and stream type must produce, on average, a flow rate that, even when reduced by kinks and elevation changes, will reliably be able to instantly and singlehandedly defeat preflashover conditions with a single stream. This approach to identifying a target flow rate and selecting a stream type provides a nozzle team with the firepower to rapidly reach, protect, and rescue trapped occupants; minimizes the nozzle team’s likelihood of being subjected to a flashover; and provides for a reliable, aggressive, and rapid knockdown to freeze the fire’s progression to a possible flashover. “Report on Residential Fireground Field Experiments” National Institute of Standards and Technology (NIST) Technical Note 1661, Gaithersburg, MD: U.S. Dept of Commerce, April 2010, 49. Grimwood, Paul, “A Comparison of 3D Water-Fog versus Straight Streams, Using ‘Burst and Pause’ Cycles to Cool and Inert Dangerous Fire Gases in the Overhead of a Compartment Fire,”www.firetactics.com/. Dunn, Vincent, “Flashover,” Newsletter. July 2000; http://vincentdunn.com/dunn/newsletters/july/flashover.pdf/, 3. “Fire Fighting Tactics Under Wind-Driven Conditions: Laboratory Experiments,” NIST Technical Note, Gaithersburg, MD: U.S. Dept of Commerce, 2009, 335. Dunn, Vincent. Strategy of Firefighting. (Tulsa, OK: Pennwell Corporation, 2007), 358. Dunn, Vincent, e-mail, Nov. 12, 2008. Clark, William E. Firefighting Principles and Practices, 2nd Edition (Saddle Brook, NJ: Fire Engineering Books and Videos, 1991), 33. Fornell, David P. Fire Stream Management Handbook. (Saddle Brook, NJ: Fire Engineering Books and Videos, 1991), 82. Flatley, Christopher, J Knapp, and T Pillsworth, “Nozzle Tests Prove Fireground Realities, Part III,” Fire Engineering, Feb 2004, 67-72. Davis, Simon K. “Fire Fighting Water: A Review of Fire Fighting Water Requirements: A New Zealand Perspective.” Project Report: Fire Engineering Report 2000/3 (Feb 2000), University of Canterbury, New Zealand. Sardqvist, Stefan, “An Engineering Approach to Fire-Fighting Tactics,” Lund Institute of Technology, Sweden, 2006, 55. “User’s Guide for the Fire Demand Model; A Physically Based Computer Simulation of the Suppression of Post-Flashover Compartment Fires,” NIST-GCR-92-612. Gaithersburg, MD: U.S. Dept of Commerce, 1992. Grimwood, Paul. “Flashover and Nozzle Techniques.” Crisis and Emergency Management Centre, London Fire Brigade, 2002. Grimwood, Paul and C Barnett, “Fire-Fighting Flow Rate,” www.firetactics.com, Jan 2005, 26. JASON N. VESTAL has 14 years as a career firefighter. He is a captain with the Sacramento Metropolitan (CA) Fire Department, where he has worked since 2000. He has an A.S. in fire science from Allan Hancock and a B.S. degree in environmental and resource sciences with an emphasis in hydrobiology from the University of California at Davis.